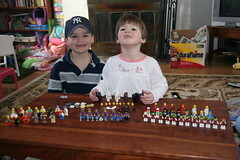 Another Delco Guy In South Jersey: Lego Census Complete!!!! John is very proud to have completed the following census of all the Lego people here at our house! He's a boy with no hat and no red. Job is a fry cook I guess. We're trying to break the Sponge Bob addiction here! Mostly it's been about providing other diversions. Xbox, legos, DVDs, outdoor activities... much more effort on the parents' part, but ultimately worth it.